City‘s new target for solar capacity set to 1,000 MW by 2030 ‘ enough to power more than 250,000 households. 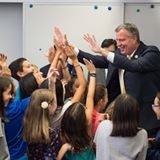 NEW YORK – (RealEstateRama) — In celebration of Climate Week, Mayor Bill de Blasio today announced that solar capacity has nearly quadrupled since the start of his Administration, and will provide 96 MW of electricity, compared to 25 MW at the beginning of the de Blasio Administration. New York, NY – (RealEstateRama) — The Department of Buildings will issue permits for more than 3,000 solar panel installations this year alone and that will bring the citywide total to more than 8,000 installations in 2016. That is an increase from 1,819 installations at the start of the administration. This solar growth puts the City on track to meet its OneNYC goals of installing 100 megawatts (MW) of solar power on public buildings and spurring the installation of 250 MW on private buildings by 2025. Because of the role these targets play in catalyzing the city’s solar market, Mayor de Blasio announced an expansion of the City’s 2025 commitment to identify and remove barriers to solar adoption in order to facilitate over ‘1,000 MW of citywide solar capacity by 2030. 1,000 MW of solar capacity can meet the power needs of more than 250,000 households. To ensure this renewable energy is available consistently, the Mayor also committed to the City’s first ever energy storage deployment target ‘ 100 megawatt-hours (MWh) by 2020. One MWh is the amount of energy produced by a 1-MW power source, such as solar panels or wind turbines, operating continually over an hour. This target will help reduce reliance on the grid by making variable sources of energy production, such as solar panels, usable for more of the day. Energy storage also helps increase the City’s resiliency by providing backup energy when the grid is offline. With already more than 2,700 solar jobs in the city, the expanded solar capacity target will enable high-paying local job opportunities and solidify the city’s position as a leading solar job hub in the northeast while extending access to clean energy for communities throughout the city. This solar target is an important step in fostering a dynamic and inclusive economy, and to develop an industry with a significant potential for new jobs and initiatives that provide more just environmental outcomes for all New Yorkers. Through an unprecedented emphasis on community energy solutions, the City will work to identify areas for community shared solar installations that enable renters and those without suitable rooftops to become solar adopters as well. ‘In my travels throughout Staten Island, I am gratified to see more and more rooftop solar installations.’ It tells me that people are paying attention, and even if sustainability is not the first thing on our collective minds, it is an economically sound approach that will yield a healthier and cleaner future for Staten Island, New York City and the United States,’ said Staten Island Borough President James Oddo. ‘Increasing the use of solar power has countless environmental, health, and economic benefits. Mayor de Blasio’s new goal for 2030 will make the electric system more efficient, create more local jobs, and reduce pollution to help New York City turn the corner on climate change,’ said Rory Christian, Director, New York Clean Energy at Environmental Defense Fund. “We applaud Mayor de Blasio for his commitment to increasing the city’s solar capacity as part of his 80 by 50 goal set forth in OneNYC. The City is leading the charge on solar by increasing installations on public buildings such as schools and initiatives like Solarize NYC, which helps make sure solar is accessible to everyone,” said Marcia Bystryn, President of the New York League of Conservation Voters. In 2014, the City made a commitment to spur the growth of solar energy in New York City on both public and private buildings, including through community-led shared purchasing, regulatory advocacy, and other support ‘ a key step towards the Mayor’s goal of reducing greenhouse gas emissions 80 percent by 2050. Thanks to programs like Solarize NYC, which has increased solar capacity in communities that have historically had limited access to solar, and the Solar Schools Initiative, which is helping over 100 schools go solar, the City is on track to reach its OneNYC commitment to solar. In addition, the Department of Buildings has adopted a number of reforms to streamline its permitting process for solar projects ‘ greatly reducing the wait time for approval of solar panel installations. In response to a spike in solar panel installations in 2014 ‘ totaling nearly 2,200 jobs, up from 662 in 2013 ‘ DOB began to implement reforms to meet the increased demand. This resulted in the average review time for solar jobs dropping from nearly five weeks in 2015 to just over one week in 2016. By allowing low-risk, small solar installation jobs to enter the Professional Certification program, nearly two-thirds of New Yorkers who invested in solar received project approvals in less than a day. The Fire Department (FDNY) has also responded to rapid growth in solar demand, releasing guidelines to clarify how rooftop solar panels can be safely installed within the requirements of the Fire Code. Earlier this year, FDNY also revised the threshold used to distinguish flat from sloped roofs, which immediately increased the solar potential on approximately 5000 rooftops citywide. Staten Island has the most to date, with 3,493 solar installations completed, an increase of more than 600 percent relative to pre-2014, and a total capacity of 30.3 MW. Queens is next in terms of cumulative installations at 1,703, as well as growth relative to pre-2014 levels (275%) and installed capacity (18.5 MW) and growth in installations. Brooklyn and the Bronx and Manhattan have each contributed and grown solar power as well. Private solar installations are rapidly expanding in all five boroughs, with installed capacity of 69 MW, up from 24 MW at the end of 2013. Staten Island continues to lead the private solar market with 30 MW installed. Separately, there are currently 2,238 private solar projects scheduled to be installed, which will add 17 MW of additional capacity. The Solar Partnership has also launched Shared Solar NYC, a program to match developers with rooftop owners that can host large ‘shared solar’ installations and offer subscriptions to shares of the project’s energy output to renters and homeowners without suitable roofs. Learn more about Solarize NYC and Shared Solar NYC on theNYC Solar Partnership webpage. The NYC Solar Partnership is led by Sustainable CUNY of the City University of New York, which works collaboratively with the New York City Mayor’s Office of Sustainability and the New York City Economic Development Corporation to promote an equitable and self-sustaining solar market in pursuit of the Mayor’s goal of increasing solar capacity around the city. The City is also leading by example, with more than double the solar installed in public buildings compared to last year. Nearly 9 MW of solar is now installed on public buildings, including City Hall, 35 schools, and major facilities like the Port Richmond Wastewater Treatment Plant. In addition to about 7 MW of solar installed to date on 35 public schools, 66 schools have solar projects underway. These 101 systems will ultimately produce about 20 MW of electricity and reduce 7,184 metric tons of CO2 emissions each year. Installing solar on City schools offers excellent educational opportunities for students, with more than 140 teachers receiving training in the development of a solar curriculum. The City is also working to assess additional workforce development opportunities with our partners in labor in connection with its solar installation program. By the end of 2016, DCAS will release a report on the solar potential of all City-owned buildings 10,000 gross-square feet or larger, as well as the solar PV installation progress to date. The City is also working to incorporate resiliency benefits into solar PV installations. Where possible, solar PV installations will be paired with energy storage systems to provide peak load shaving, emergency backup power and to help reach the new citywide 100 MWh energy storage target by 2020.